If you’re looking for a comfy place to stay in the heart of Sarajevo, just minutes from the main pedestrian zone, you came to the right place! If you would like to stay in the city center, yet enjoy a peaceful and noise-free sleep, my apartment is just a perfect place for you. The apartment has been fully renovated and is located in the city’s central zone in the close proximity of all city attractions. The apartment consists of two rooms: a kitchen with a dinning space and a large living room with a lovely terrace. It accommodates for four people, offering one king-size bed and two single beds, making it perfect for a family visit. It is located just a street away from the main pedestrian zone with bars, restaurants and other night life attractions. 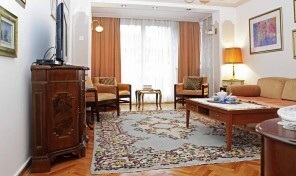 The apartment is also just 50m from the National Theatre – the red carpet site of Sarajevo Film Festival. The entire city center is at your reach and there is no need for using public transportation, but if you decide to go outside of the city center, a tram station is just 100m from the apartment and it can take you where you need to go (other parts of the city, railroad and bus station etc.). There is also a parking space just 20m from the apartment with cheap prices and Fonty apartment also offers the possibility of renting a garage for your mechanical pet.